You may not pay much attention to your browser's address bar while you're clicking around in Gmail, but each screen—from search results to individual emails—has its own unique URL. That means you can bookmark these URLs to give you quick access to searches, filters or threads you want to refer to frequently. Get whatever you need up on screen, whether it's the ongoing email thread about your summer vacation or a list of all the emails from your boss. You could enter "is:unread" in the search box to see all unread emails perhaps, or "is:starred" to view starred ones—it's up to you. These unique URLs update dynamically, which means if you bookmark a search it will always lead to the most recent results, if you bookmark a thread you'll always see the most up-to-date version, and so on. It works with labels, individual messages, and anything else you can bring up in Gmail. 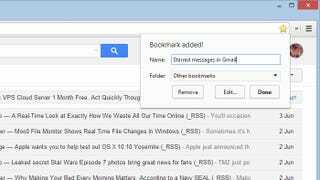 Power up your bookmarking method of choice in your Web browser of choice to save the Gmail screen you see before you. The bookmark name might need some editing to help you make sense of it, and you might want to create a special "Gmail bookmarks" folder to keep everything organized too. You can then simply click on any bookmark to view it—you might never have to open up your inbox again. Of course you can also create Web shortcuts on your desktop leading to your favorite labels, searches and email threads. Don't forget you can use system labels like "Sent" or "Drafts" too if you want to. There's even a Gmail Labs widget called Quick Links that you can use to access these bookmarks from Gmail itself: open the Labs tab in Gmail Settings to find it. And then get ready to cruise through your inbox with more efficiency than ever before.